Email inbox is the huge part of my productivity. I am using it as a task manager: it is easy to sort and organize email messages as separate tasks (with Thunderbird, I can also bring it to my desktop, and enjoy more flexibility with options). However as an active social media user, I have to deal with hundreds of automated email notifications and alerts daily (and on busy days even hourly). How not to get lost in that clutter and not to miss important tasks and emails? Following what your friends are saying is by far the most important part of social media networking – it’s the essence of it. You can’t be just a broadcaster: You need to listed to others. But how to keep updated of everything your friends are sharing without losing your day job? If you are an active social media user, you are most likely to get hundreds of friends’ updates every minute. Following your friends via RSS is one option but from experience I know, RSS is not motivational at all. Your feeds can wait for weeks until you at last find time to click through them to find the updates. For busy networkers it’s not the best solution. Nutshell Mail (for Twitter, Linkedin and Facebook) and Commun.it (for Twitter) are two tools I’d highly recommend for decluttering your social media emails. We’ve mentioned Commun.it previously when discussing ways to build links through building relations as well as ways to save time. Nutshell Mail is an email aggregator of your contact recent updates. Currently it supports Twitter, Facebook and LinkedIn and allows you for much better productivity while still being well connected to your social media contacts. 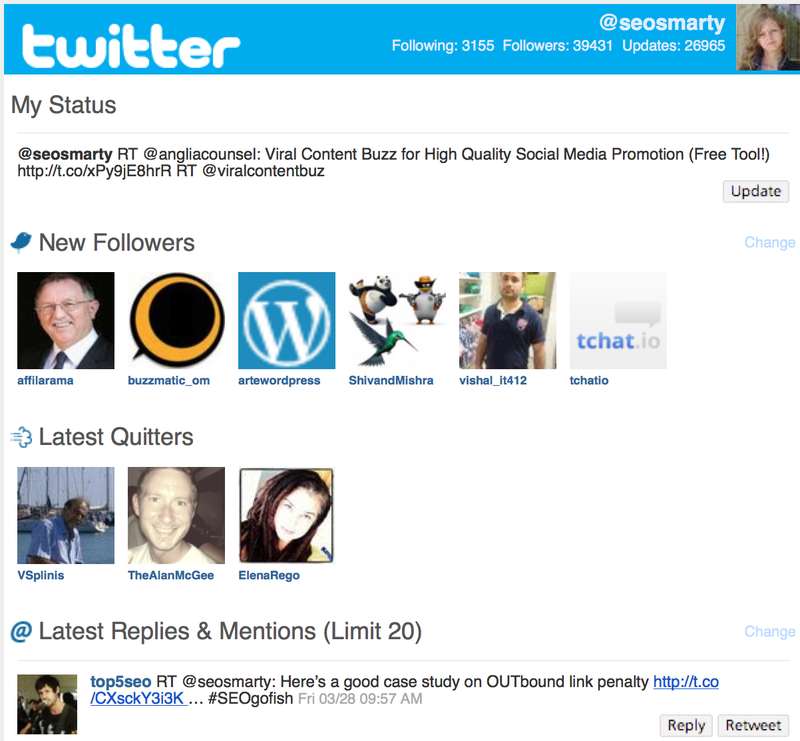 With Twitter you can include new followers and “Quitters” in the update as well as replies, direct messages and latest Tweets. An email hanging in your inbox – what can be more motivating to stay constantly in touch with your (business) contacts! I am in no way a mass follower but I am not the one who would not follow anyone back unless I know the user personally. I am open to building new genuine connections every minute of my life – and I would not want to miss any opportunity to get to know someone new online. 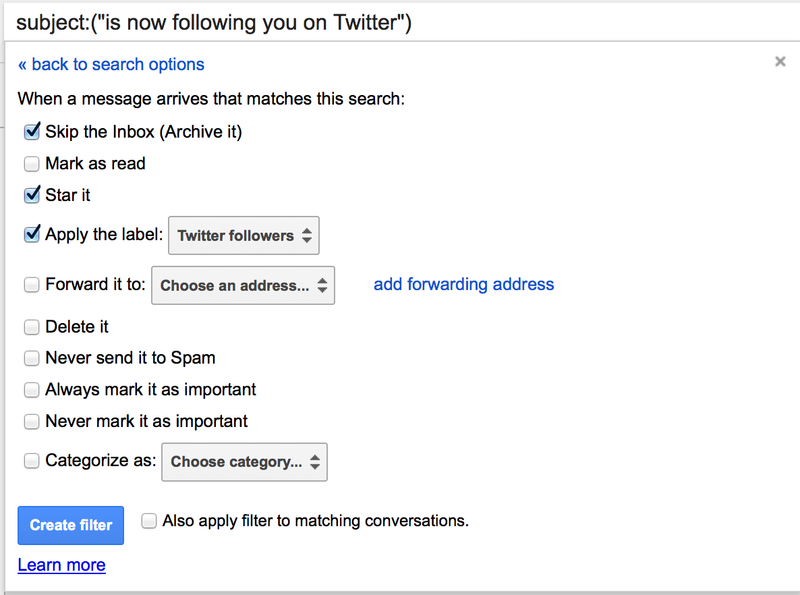 Search Gmail for “subject:(“is now following you on Twitter”)” and create a new filter from there. From now on you won’t have to hourly get distracted by viewing your new connections: just make it part of your daily routine to check that label. Note: Gmail “Social” tab should be also helpful for email decluttering but I couldn’t figure it out to the extent when it would become useful. And what are your tricks for being constantly in touch with your social media network of contacts while still having some time to work? Please share your tools and tricks!